Originally built in 1927 for the Metropolitan Life Insurance Company in Ottawa, The Wellington Building is an adaptive reuse project architecturally haunted by the ghosts of its past. The 1920s Beaux-Arts building, which received an infill-addition in 1959 and was acquired by the Canadian Government in 1973, sits on the south side of Wellington Street just west of the nearby gothic-revival Parliament Buildings. This proximity, in concert with its striking limestone façade and heritage features, makes it a fitting location to house the country’s Members of Parliament (MPs) and various government activities during the forthcoming, decade-long restoration of the Centre Block building. NORR Limited was awarded the contract for the $425-million rehabilitation in 2008, with six years of construction beginning in 2010. During this time, an extensive renovation of the entire building resulted in the complete reworking of the space, both structurally and programmatically, in an attempt to unify the two eras of the site into one cohesive, code-abiding structure. As such, the building was stripped down to its interior infrastructure in order to perform seismic upgrades, in addition to having all windows replaced and new mechanical and electrical systems installed. The Wellington Building’s original 1927 entrance was developed as the private entry for MPs, with the 1959 entry reconstructed and turned into a public one. Equally challenging was the need to fit 70, exterior-facing MP offices, 10 multi-purpose rooms (MPRs), a cafeteria, public spaces, and a satellite location for the Library of Parliament, all within the fixed envelope of the existing site. 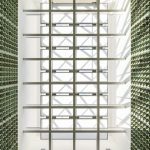 Yet while the project called for multiple technical, practical, and high-level security features, the nuances of the design response added layers of meaning and dignity to a building that will act as a place of national significance for the foreseeable future. This is most evident in the treatment of the 1927 heritage components, and the value that was placed in either diligently restoring, or appropriately referencing them, in ways that allow for the spirit of the past to infiltrate into the value of the present-day. These spaces now act as the entry sequence for MPs and add a level of history to the new government building, while also working to inform the overall interior design scheme. 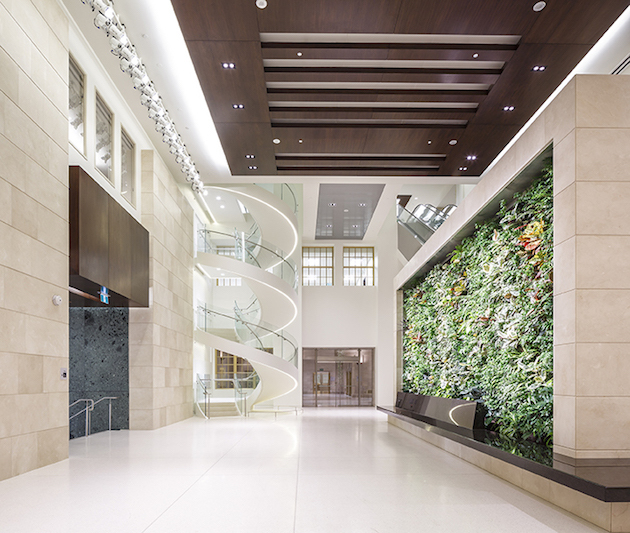 In order to provide access to the upper level multi-purpose rooms, a new public space system has been developed, including a two-storey ground floor atrium with a green wall, spiral stair and escalator all located in the heart of the building, recreating a light well that was previously in that location. As an adaptive reuse project, NORR had to carefully balance the often-blurred lines between restoration, replication, and renovation. As such, the areas of highest heritage value – which include the northern exterior façade, Wellington entry vestibule, and adjoining heritage lobby – were all treated with varying conservation methods. 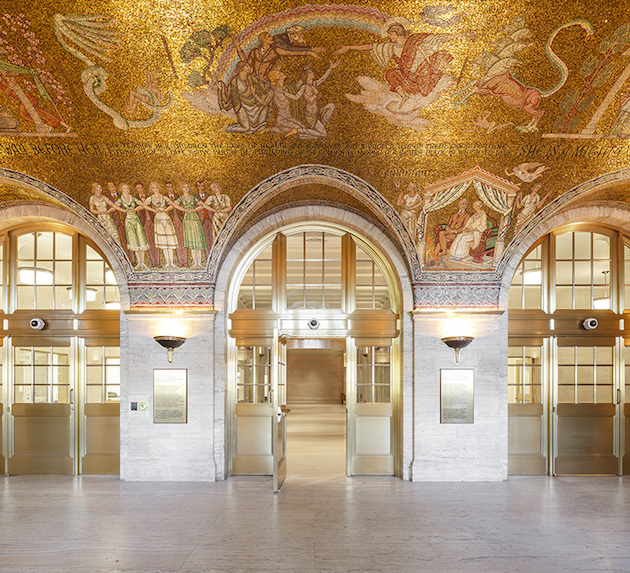 These undertakings involved the reintroduction of a canopy along Wellington Street, the careful restoration of American-muralist Barry Faulkner’s golden glass-tiled mosaic ceiling in the original vestibule, and the removal, storage, and careful reinstallation of the heritage lobby. This lobby then opens onto a new, multi-storey, contemporary atrium that references the light well that once stood in this place. 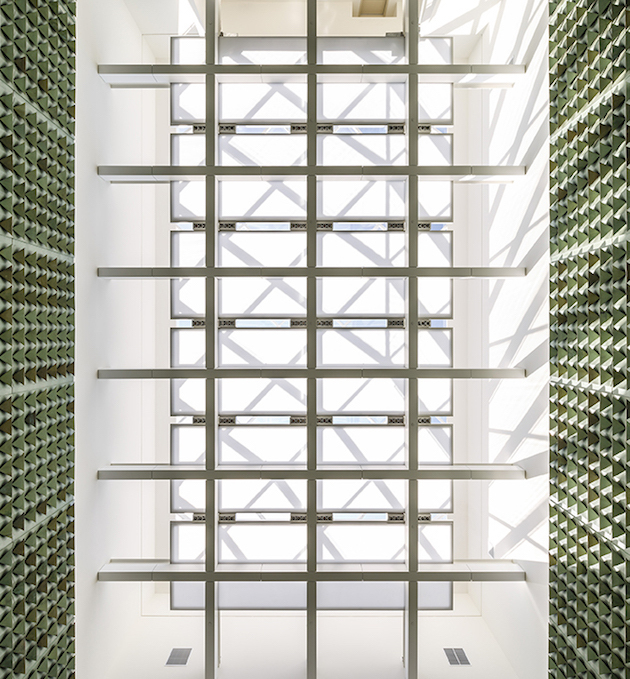 The Wellington Building’s two-storey skylight-lit Library of Parliament space includes walls fo acoustical wood panels with sculptural copper shells in front of a perforated copper acoustic wall backing. It is the heritage lobby, as such, that acts as the threshold between the new and old, and that first hints at the ‘ghosts’ that now inhabit and flow throughout the building. For while the original marble and minimally ornamented room was fully and diligently disassembled, before being faithfully reconstructed, the elaborate ceiling moldings that had once embellished the space, could only be replicated in form and not colour. The wall backing is constructed from copper recycled from the 1927 roof that was replaced as part of the project. This juxtaposition of materiality and heritage allows the past to play against the present, as the original Bottichino marble details of the room are set against a crisp white ceiling. This contrast is important, however, as the heritage lobby now gives way to the modern atrium that now acts as the structural the circulatory core for the building, as well as the first point of arrival for the public, who enter from the south through the 1959 entry off of Sparks Street. Aligning with the exterior fenestration and pilaster pattern, crush spaces have views of the Corinthian column capitals of the heritage facade, Parliament Hill and the surrounding cityscape. This space, which was once a light well in the original 1927 building plan, also gives a sense of the site’s previous essence. 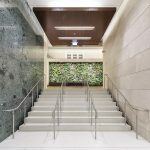 This is achieved through the reintroduction of windows that look into the space, as well as through the inclusion of a ‘green wall’ that helps to create the sense of an exterior space, while also anchoring the room and concealing the escalator behind it. The atrium has a minimal, modern, and distinguished aesthetic, with all elements held within it acting on a grand scale. 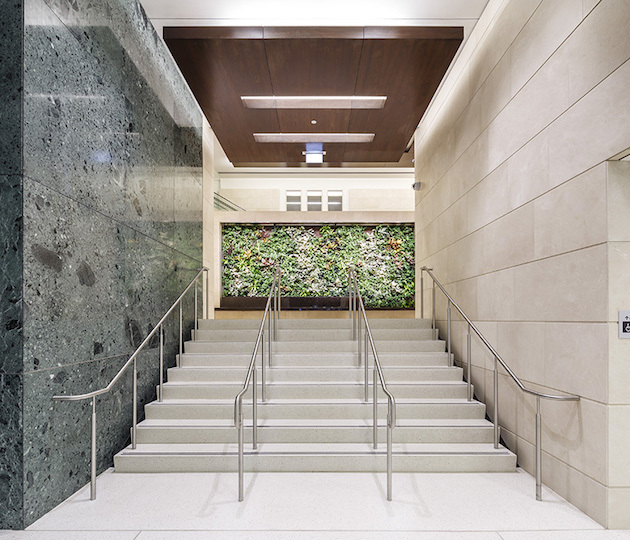 From the monolithic framing of the green wall and the long, low, linear marble bench that wraps around it, to the ephemeral and sculptural spiral stair, the brightly lit space feels inviting and formal simultaneously. It also works to organize the rest of the building through what Clusiau refers to as a “series of stacked public spaces.” This included the need to visually blend the two past phases of the building’s life, while allowing for important physical separations to exist for security reasons. Thus the question of how to move the public from the ground floor entry space to the upper level MPRs, without compromising security or interrupting the activity of MPs, was central to the organizational system of the renovated building. The need for such circulatory problem solving resulted from the decision to locate the MPRs on the upper two most floors. As the fourth floor had the highest ceiling heights, having been built on top of the original 1927 building, it was decided that the third and fourth floors could best accommodate the technical components required of the rooms, such as broadcast lighting. 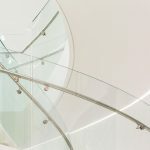 This was resolved through the introduction of a three-storey escalator and spiral stair that only provide access to levels that are accessible to the public. 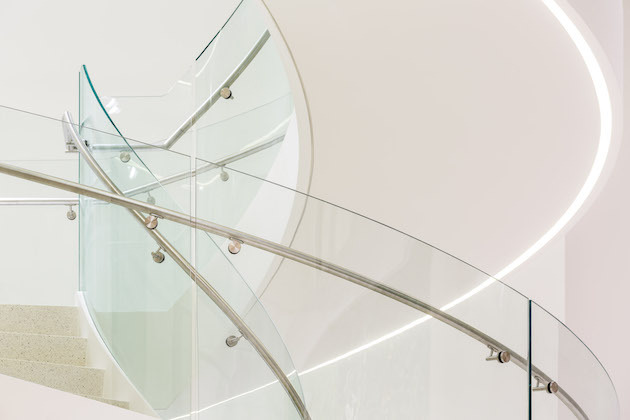 Yet while the stair serves a utilitarian purpose, the white, glass and chrome metal structure, set against the creamy stonewall behind it, is a striking element that harks back to the architectural language of the International Style and the building’s 1950s legacy. 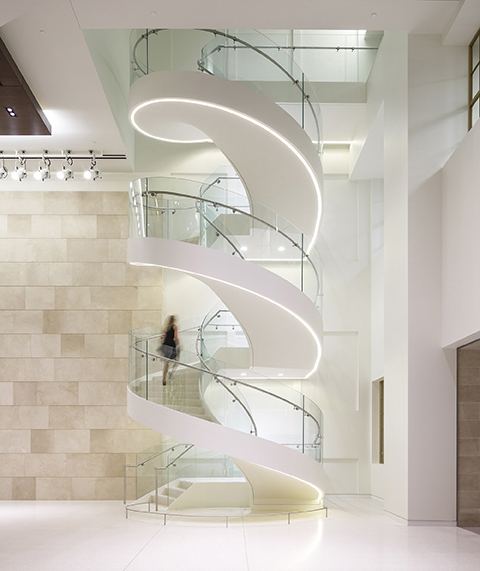 The spiral staircase brings a contoured, kinetic element to the ground floor atrium. Once on these upper floors, sweeping ‘crush’ spaces run the length of the exterior facades, giving way to views of Parliament and the street below. Looking out through these windows, one is also brought to eye level with the flourishing capitals of the 1929 Beaux-Arts Corinthian columns that adorn the building’s stately northern exterior. And here too the sense of being suspended and caught between times and histories is felt. For the space is held on one side by the regular and rigorous geometry of the original exterior wall, with the interior rhythm of the colonnade now boxed in by white-painted gypsum casings, while on the other side, a new, limestone-clad wall elegantly bends, mixing the traditional material with a more modern profile. Off of these hallways, MPRs are tucked away and lined in rich walnut wood paneling, allowing the business of the country to happen uninterrupted and with a sense of the importance of the work that takes place within them. MPRs are wrapped in walnut wood paneling tone evocative of the government work occurring within. One of the most interesting spaces, however not accessible to the public, is the satellite Library of Parliament facility, which is lit from above by a generous skylight. While normative in its layout and form, the detailing of the walls is both acoustically functional and symbolic of the spirit of the building’s past. 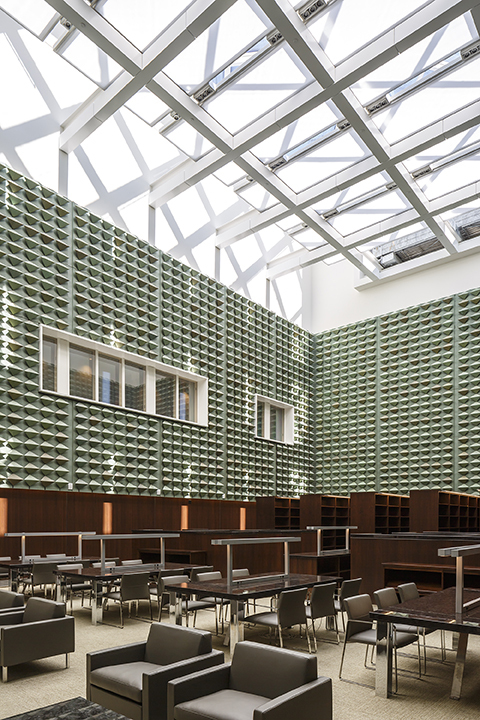 Lined with perforated wood panels on the lower half, the upper portions of the walls are dutifully scaled by folded plates of cooper, moving the eye up vertically to the skylight above, and casting shadows on the walls below. 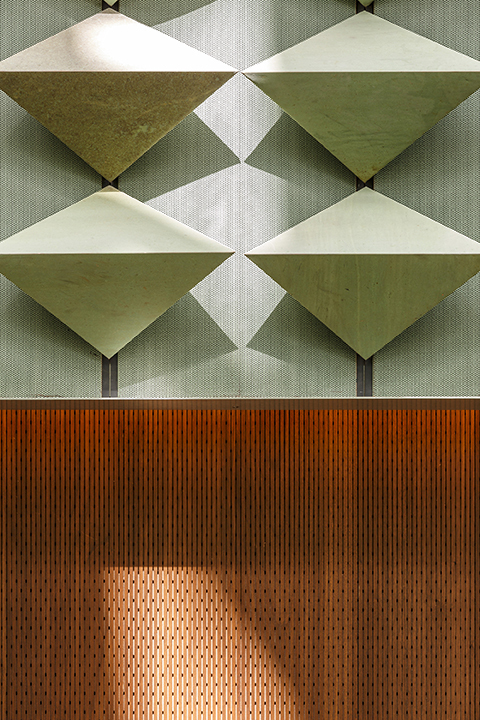 Constructed from copper recycled from the original 1927 roof that was replaced during the rehabilitation, these triangulated ‘sculptural shells’ give a three dimensionality and tactility to the regular and flat surfaces of the walls. The copper is weathered and patina-laced, with each panel having its own distinct colouration and variation of patterns, as well as evoking memories of Parliament. “The idea that it reappears here as a connection back to the Library of Parliament is a pretty appropriate connection,” Clusiau concedes. What unifies and yet haunts the building of its past life most subtlety, however, is seen in the effort to salvage and repurpose many of the found materials that occupied the space previously, being brought back to life in a new form or location, such as a speckled green marble that was added in 1959 and now clads a wall in the Sparks Street entrance. The highly restrained yet sophisticated material palette was achieved through a focus on texture, as opposed to colour, giving a neutral yet layered quality to the space. Antique brown marble is found throughout the building’s horizontal surfaces and closely matches the tone of the walnut found throughout, creating an interesting contrast between the warmth of the wood and coolness of the stone. Likewise, tone-on-tone shades of white and cream accentuate the bathrooms, and the use of a single form of limestone creates a cohesive, timeless, and durable set of finishes.